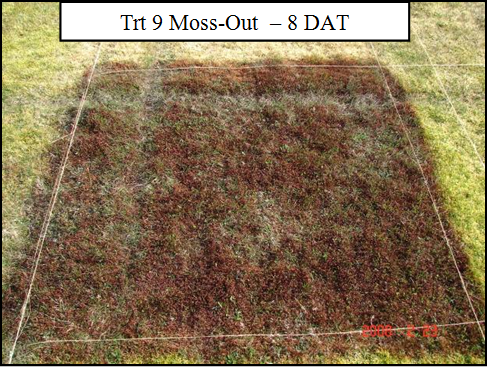 The objective of this trial was to compare two formulations at three rates of citrus oil (d-limonene) with three commercial standards (Worry Free Moss & Algae Control, Garden Safe Moss & Algae Killer, and Lilly Miller Moss-Out) sprayed at label rates to determine injury and control efficacy on lawn moss (Brachythecium albicans). The trial was initiated on February 15th at the Lewis-Brown Horticulture Farm in Corvallis, Oregon. 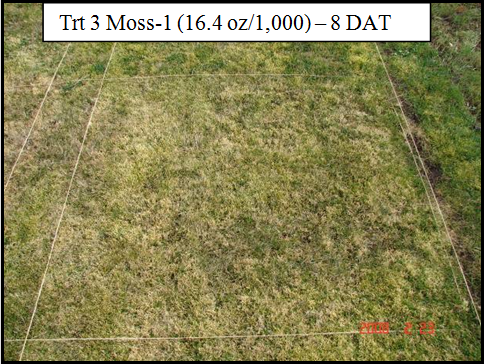 The trial site was a mixed stand of eco-lawn plots consisting of various mixes of perennial ryegrass, fine fescue, bentgrass, clover, common white yarrow (Achillea millifolium), and heavy populations of feather moss (Brachythecium albicans). The first two reps were on a silty clay loam soil with a pH near 6.0. The third rep was on a more sandy soil, but because of adequate rainfall, it did not appear to have any impact on this trial. The daily high temperature and relative humidity on the date of application were 55 degrees Fahrenheit and 58%, respectively. The treatments were applied between 2:25 pm and 3:35 pm under full sun. Since it was dry the day of the application, all plots were sprayed with 2 gallons of water per 1,000 square feet to moisten the moss. The water was applied 15 minutes before the treatments began being applied. The treatments were applied in treatment order from 1 to 9. 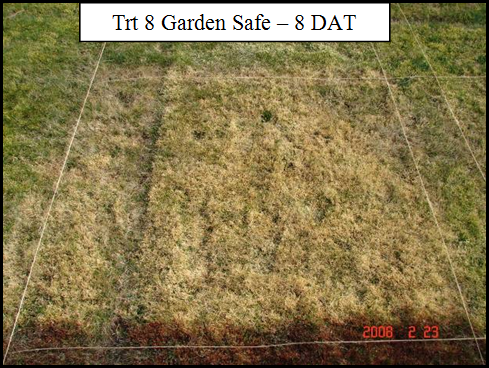 All treatments were applied with a CO2-powered plot sprayer with a 5 foot boom using TeeJet 80015 flat fan nozzles spraying 2 gallons per 1,000 square feet. All products were applied at a spray volume of 6 gallons per 1,000 square feet by spraying each plot three times. Before a new chemical was applied, a 2 liter bottle of clean water was sprayed through the sprayer to clean it out. A metronome was used the time each application. Because of cold temperatures, the plots were not mowed until 6 weeks after treatment and then mowed weekly at 2 inches with a bagging rotary mower with clippings removed. 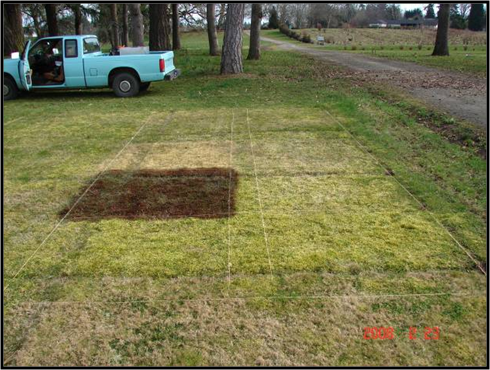 During the trial, the plots were irrigated occasionally to ensure that the moss did not dry out before all ratings were completed. Visual moss injury ratings were made on February 18 (3 DAT), February 23 (8 DAT), February 29 (14 DAT), March 17 (4 WAT), and May 2 (11 WAT). The data for each rating date were subjected to analysis of variance (ANOVA) and differences between means were determined by LSD at the 5% level. Moss is a non vascular plant without roots. As a result, it cannot translocate chemicals making it difficult to kill unless the entire plant absorbs the chemical. In dense stands of moss, as we had in this trial, it is impossible to penetrate the moss canopy completely using the water volumes sprayed in this trial. 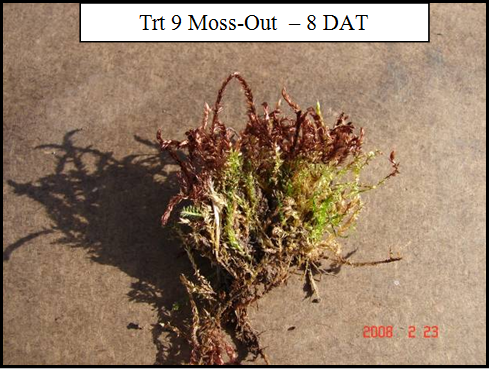 In essence, the top of the moss plant insulates the bottom (See photos on page 4.). 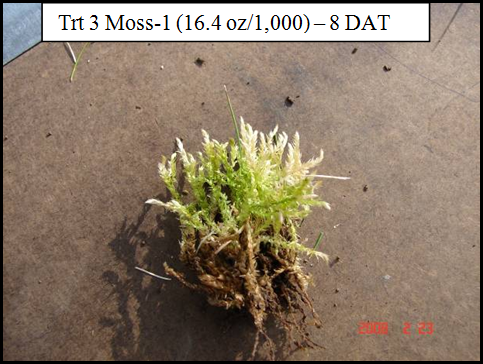 Although three of the treatments injured the moss severely, none of moss was completely killed resulting in no control. A more effective strategy in dense moss stands would be to remove most of the moss mechanically using a dethatching machine. This process would open up the moss canopy and allow the chemicals to penetrate the remaining moss resulting in more moss kill. The last step would be to fertilizer the lawn so the grass can more effectively compete with the moss. 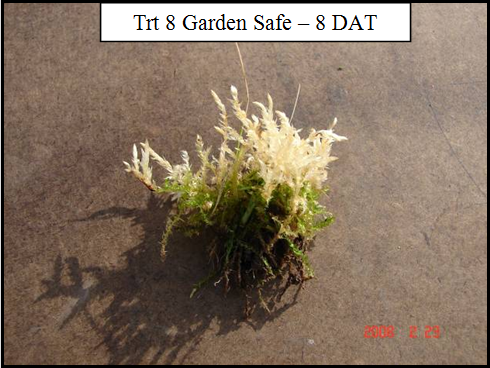 In this trial, treatments 8 (Garden Safe Moss & Algae Killer) and 9 (Lilly Miller Moss-Out) produced the most moss injury rating 5 out of a 1 - 9 scale. 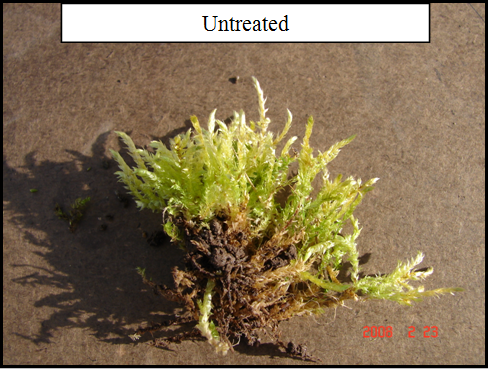 Treatment 3 (Moss-1) applied at the high rate, rated a 4.3. In all cases, the injury occurred in the first 7 days after application and there was only minor recovery even after 11 weeks (see moss injury data on page 4). However, as stated above, there was no moss killed in this trial. 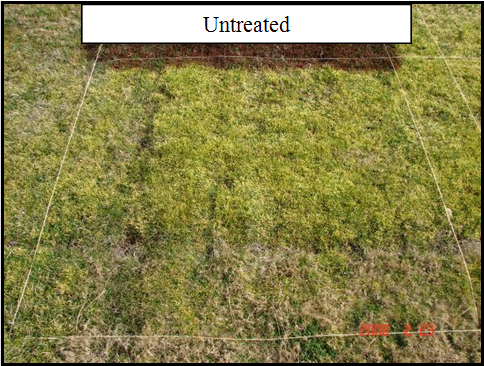 There was no obvious turf phytotoxicity as a result of any of the treatments.